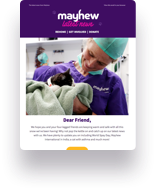 Mayhew's Animal Welfare Officers rescue abandoned or mistreated animals every day. Our team of Animal Welfare Officers work with the local community to help to improve animal welfare and rescue abandoned or mistreated animals. Many of the animals that arrive at Mayhew have been abandoned or found as strays. We are often called by helpful members of the public who alert us to animals who are in distress or roaming the local streets. Our Animal Welfare Officers will then respond to these calls and go to help the animal in need. Once the animals have been rescued, they are often treated by our community vet clinic. Once they are back to full health, we will then help them to find a new, loving family. You can help us to keep rescuing animals from situations where they suffer cruelty and neglect. Make a difference to an animal in need!